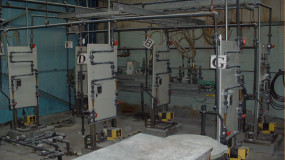 Basin Electric | ProMinent Fluid Controls, Inc. The Basin Electric Power Cooperative’s Laramie River Station (LRS) has its own water plant that utilizes six (6) primary basin clarifiers. Each basin has a recirculation rate of 3,000 to 4,000 gallons per minute and each clarifier is chemically treated with lime for partial lime softening. Sodium Aluminate and an Anionic Flocculent are used to create floc that settles to the bottom of each basin, creating a “blanket”. LRS had been using Stranco Polyblend make-down systems until 2001 for each of the six (6) primary basins. Maintenance hours were high due to the amount of disassembly required to clean the polymer injection valve and to work on the paddle shaft seals. 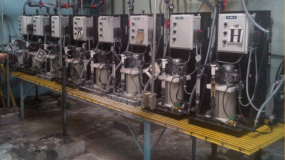 In 2001, the plant purchased six (6) new polymer make-down systems consisting of primary and secondary flow meters to feed three static mixers. 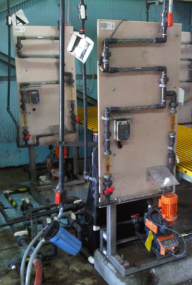 These systems were fed polymer from the same six (6) LMI chemical feed pumps used on the original Polyblend systems. 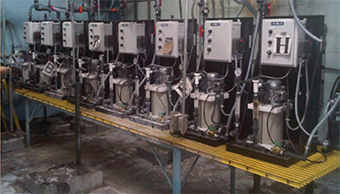 Polymer feed problems continued due to the small configuration of the pump head and poor speed control. The static mixer setup did not yield peak efficiency but was sufficient for several years of operation. The polymer system was evaluated in 2009 and it was determined that savings could be realized by reducing polymer consumption. In March 2010, the plant obtained a ProMinent ProMix-S polymer make-down system through a 30 day trial offer and the plant saw results immediately. LRS proceeded to purchase seven (7) more ProMix-S units due to savings realized from fully hydrating the emulsion polymer and the consistent concentration delivered to the basins. Currently the LRS water plant has eight (8) units operating at this facility. One designated stand-by unit and an additional polymer injection point in LRS’ secondary basins was identified; this will assist in settling any potential sludge that may be carried over from the primary basins.